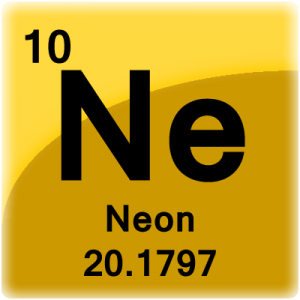 Neon is the tenth element of the periodic table. These neon facts contain chemical and physical data along with general information and history. Discovery: Sir William Ramsay and Morris W. Travers in 1898. Ramsay had already discovered argon and helium. He deduced there must be an element on the periodic table that would appear between the two. They eventually separated gases from liquid air under reduced pressure. They ionized their samples to obtain their spectra. One sample glowed with a vivid red light never seen before. They knew right away they had discovered the element neon. 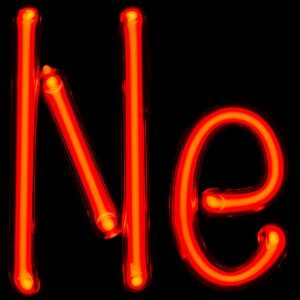 Name Origin: Ramsay named the element neon from the Greek word neos meaning new. Natural neon is comprised of three stable isotopes: 20Ne, 21Ne and 22Ne. Sixteen Radioactive isotopes have been produced under laboratory conditions ranging from 16Ne to 34Ne. Neon-20 is a stable isotope containing 10 neutrons. 90.48% of natural neon is neon-20. Neon-21 is a stable isotope containing 11 neutrons. 0.27% of natural neon is neon-21. Neon-22 is a stable isotope containing 12 neutrons. 9.25% of natural neon is neon-22. 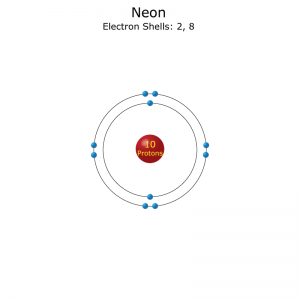 Electron configuration of a neon atom. Neon is a colorless, odorless and tasteless gas at room temperature. 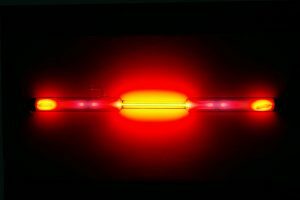 Neon is the fourth most abundant element in the universe but is relatively rare on Earth. Only one part in 55,000 parts of air is neon. Neon does not naturally bond with other elements. There are no known helium compounds. The famous neon sign was invented in 1910 by Georges Claude. They debuted at the Paris Expo. Neon is monatomic and is lighter than the diatomic elements of nitrogen and oxygen in air. If you fill a balloon with neon gas, it will float like a helium filled balloon, but it will rise slower. Neon is used in lightning arresters on power lines and telephone poles. The only commercial source of neon is air. Liquid neon is used as a refrigerant. It has forty times the cooling capacity per volume of liquid helium and over three times as liquid hydrogen.